Kitchen/Dining/Living area: Open Plan, stylish, modern, high gloss kitchen with fully integrated hob and oven. Dishwasher, fridge freezer, granite worktops, double sink, washing machine microwave. Dining table for 6 plus breakfast bar for 4. Bedroom 1 : double bed with en-suite shower and wc, side view of vines and sea. Bedroom 2: full size bunks and view onto terrace and mountains. Bedroom 3 King size double bed with stunning balcony overlooking the bay. Main bathroom: full size bath with separate shower, double basins and WC. Loft Bedroom: double bed + 2 seater sofa. Linen and house towels incl. Beach towels not provided. This fabulous waterfront 4 bedroom property, from first floor of old stone house has been completely renovated and refurbished to a high standard but still keeping its original character and is an ideal base for just relaxing or exploring the Boka Bay and surrounding coast. It is only 5 meters from the sea in a quiet area with numerous alcoves, jetties and shaded areas and dotted with restaurants and small convenience shops. It is a beautiful short walk along the bay past the boats, yachts and old churches to the historical old town of Kotor, a World Heritage Site. The property features old stone and original wooden beams throughout with a stunning front balcony off the main bedroom with panoramic views over the bay. There is a larger side terrace with table and chairs to enjoy an evening meal or a glass of wine. Notes on accommodation: Air-conditioning in living area and bedroom area of house . TV and Internet. The property is a non smoking zone but you are welcome to smoke on balconies and terrace, whilst enjoying the fantastic views. Outside: First and foremost you are only 5 meters from the sea with easy access. Swimming directly outside the house for swimmers. Younger children can walk into water from numerous alcoves about 5 mins walk from the house Dobrota House has private balcony off main bedroom with 180 panoramic views of fjord and mountains. Side terrace has table and benches for 6 and additional lounger chairs. Ideal for evening sun downers and entertainment. Perfect combination of peace and quiet but plenty to do in the vicinity. So wonderful to have a dip in the calm waters just on the doorstep when it got hot. The house has tons of character, the beds comfortable and equipped with everything you need for your hols. The only thing that should be mentioned is the steep staircase to the upper floor as some guests may struggle with this. Jules was great at keeping in touch and answering our questions and, despite the language barrier, the neighbours were lovely too! Absolutely lovely and charming home - beautiful rooms, everything we needed, stunning location! Stunning location, located in an ideal area for walking or boating to so many beautiful and interesting areas. House was clean and great decor and views. Jules was a joy - super helpful and responsive. Jules, I can't say enough about your accommodation. It certainly did not disappoint. Your pictures do not do this place justice. This was by far the best and most interesting place that we have ever stayed in. There are so many unique features which maintains its charming appeal. I would highly recommend your place to everyone I know. It was spacious, clean, location was great, close to adjacent towns, restaurants, tourist attractions, old town of Kotor, grocery store and the beach. I especially enjoyed the view from the third floor balcony. Thank you for that. It had everything we needed. We really enjoyed celebrating our 35th wedding anniversary in Montenegro and I'm sure there will not be anything that compares to your Old Captains Stone House. Thanks again for the memories. Thank you for the lovely review, we love that you enjoyed your stay on such an important occasion. We agree it is in a great location. We will look into taking nicer photos to reflect the charm of our old stone house, so guests can appreciate the beauty of the house. A very enjoyable stay in this property. We hadn't visited this area before and we were very pleasantly surprised by its beauty. All the information given to us by the owner was very useful. The owner communicated well with us . There are quite a lot of stairs in the property and some people may struggle with them. We really enjoyed staying in this quirky home, which provides an ideal location from which to explore the coastal charms of Montenegro. We really enjoyed jumping (or, for some of us, tentively tiptoeing) into the clear waters of the Adriatic from our little patio perch. We felt that we were close enough to other major destinations, but also far enough away from them and the crowds. We especially enjoyed the summer evenings with the sun behind the peaks, and the colors changing on the water and the mountainsides. The neighborhood proved to be delightfully quiet and peaceful in the evening. The owner was very attentive and helpful whenever things came up. Tivat airport is only 20 mins drive away. Dubrovnik Cilipi airport is 55kms (bus service and taxi). This is a lovely scenic drive along the bay. 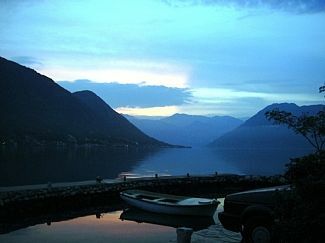 Taxis are readily available and very reasonable (red cabs) for travel in and around Kotor bay. Kotor is 2kms away - walking distance or a 3 euro taxi ride - a lively medieval town with regular festivals and a vibrant night life. Perast is 15 mins along the coast - a beautiful restored stone village with beaches and good restaurants. Budva is ancient town and has good beaches about 50 mins south. Things to do - depends on how vigorous you want to be - evening stroll along Dobrota waterfront with quiet bars and restaurants to stop off at. Boat trip to islands off Perast - Our lady of the Rock and Abbey of St George. Early morning walk along old walls above Kotor gives an unparalleled view of Kotor Bay as well as giving you an invigorating start to your day.